CHELSEA, Mich.–Is it possible that a play written 72 years ago could be ripped from the headlines of today? Perhaps. Indeed, the test of a play, whether it’s timeless or of temporary relevance, is how current it feels when you peel the outer layer of the onion. Arthur Miller’s All My Sons is ostensibly about a family that is torn apart by secrets and betrayal. It is set in the years just after World War Two, about a patriarch who owns a small factory in the heartland of America–Indiana. The family is clearly fractured. Joe Keller’s (Richard McWilliams) former partner is in jail for having knowingly shipped faulty parts to the Air Force during the war. The parallel story is that the Keller’s son, Larry, was shot down off the coast of China and is missing-in-action. His mother, Kate (Michelle Mountain) keeps up hope that he will yet be found, perhaps on an island in the China Sea. Chris Keller (Ryan Black), the younger son, was also in combat and had a difficult war, losing most of his men, and he has a certain amount of survivor guilt. He helps run the family business, and he is even in love with Larry’s old sweetheart, Ann Deever (Caitlin Cavannaugh) who is the daughter of Joe’s jailed partner. The relationship with between the Kellers and the Deevers is incredibly awkward and fraught. It feels throughout the play that they areall on the head of a pin. Add to the mix the fact that Kate feels like Ann and Chris are betraying Larry for whom she is still holding a candle of hope. The lies hang thick in the air in this play. The audience knows it too, which creates an edginess during the whole story. What we come to find out is that the whole neighborhood knows about the lies. Chris pretends he doesn’t know, but we all know he does deep down long before the play’s denouement when the surviving child confronts his father. They all have cracks that have been soldered over, but they will be their undoing. McWilliams and Mountain, reunited on stage, are wonderful to watch. Mountain wears her anguish in every movement of her body, and her Kate is made of glass with a thousand cracks. McWilliams nails his 1940s patriarch in every inch of his performance as the confident, jovial Joe, who can nonetheless be snapped back to paranoiac stiffness over just the right comment or wind gust. He plays at appearing to be comfortable in his own skin, but he is anything but. Keller is a family patriarch who is ethically bankrupt, and justifies his actions based on some misguided, naked goal of amassing wealth for his family. Being a good provider. And he does so amidst a crowd of people who knows he is, at bottom, without a true moral compass, and they wink and nod at him. They know he is a liar, and still they keep their silence and are complicit. The story shows itself to be as current as yesterday’s baseball box scores. 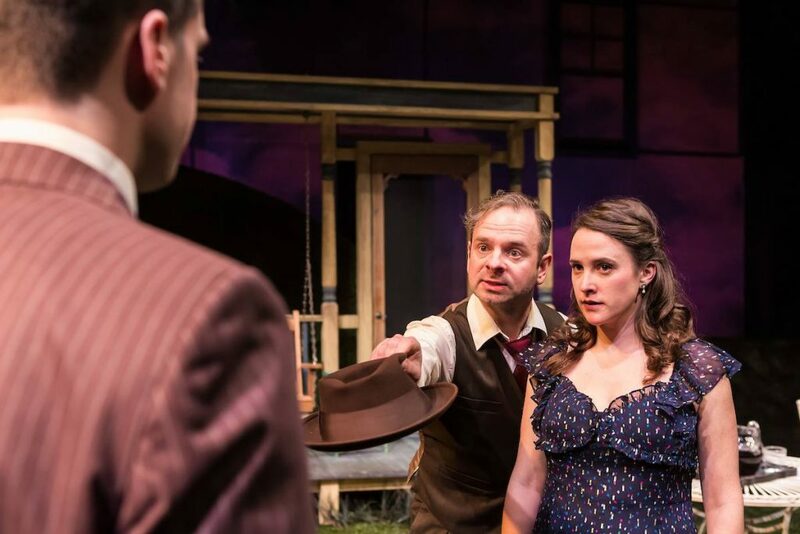 Directed by Guy Sanville and Assistant Directed by Angie Kane Ferrante, All My Sons features a terrific ensemble of supporting actors, oft seen on The Purple Rose boards. Cavannaugh’s Anne plays her role as disrupter with sexiness and truth. Her penetrating eyes and attitude are felt throughout the theater. David Bendena, as George Deever, Ann’s brother who trains into town after seeing his father in jail, is menacing and vulnerable all at once. Susan Craves as neighbor Sue Bayliss carries around uncomfortable truth like it was in her purse, always at the ready to present it. Tom Whalen, as her husband Jim, is an interesting foil to both his wife and to the story, wanting for a simpler, more heart-honest life than what he is living. Rusty Mewha and Lauren Knox play Frank and Lydia Lubey, neighbors who seem to be the foil to the Kellers–straight and secretless. The role of Bert, a neighbor kid, is double cast. On opening night, Olivia Goosman inhabited the role, and does so with an almost ethereal presence, representing perhaps the way things were when Larry and Chris were kids and war had not changed everyone. The set, designed by Sarah Pearlstein is the picture of a Kokomo, Indiana backyard in 1949. The wrought-iron table and chairs are period-perfect, and she even seems to have stitched perfect weeds into the fake grass on stage. There is puzzling use of the green landscaping on either side of the back porch, but it doesn’t detract–it just begs a question or two. Likewise, Suzanne Young’s costume designs are just right for the late 40s. The high-waisted pants for the men and the knee length print dresses for the ladies are gorgeous. Arthur Miller was inspired to write the play based on seeing a small story in the newspaper about a family that closely resembles the Kellers and the actions that tore the family apart. Miller wrote this play before he wrote Death of a Salesman, but there is literary lineage between Joe Keller and Willy Loman, between their stage/story wives and even the sons. The late 40s was a time of generational passage. The Joes and Willys were too old for the war. Their sons who fought came home, damaged, and mostly ready to reshape the country that had suffered a decade of despair in The Great Depression. Men and women who fought in wars, the good people, would go on to feel the spirits of the dead tugging at their elbows, reminding them that they survived the ravages of war to do good, to do right, not just for themselves and their families but for the men and women who did not get the chance. The survivors carried an extra burden. Money is worthless if it is not backed up by ethical dealings, without doing right by the people you meet along the way. Truth always comes, even if it is delayed in its arrival. Many will have seen the movie based on Miller’s play, starring Edward G. Robinson and Burt Lancaster. The play is not frequently done, though it is enjoying a revival on Broadway this year. This production crackles with currency and features heart-wrenching perfornances. It plays through June 1.